Crunchy, sweet, nutty, and bursting with flavors is how I define these oatmeal energy bars. Loaded with fiber and essential nutrients, this energy diet bar recipe uses nuts to add energy, oats to pack them with fiber and cornflakes for that crunchy effect. Are you looking for a nutritious snack recipe for preschoolers? 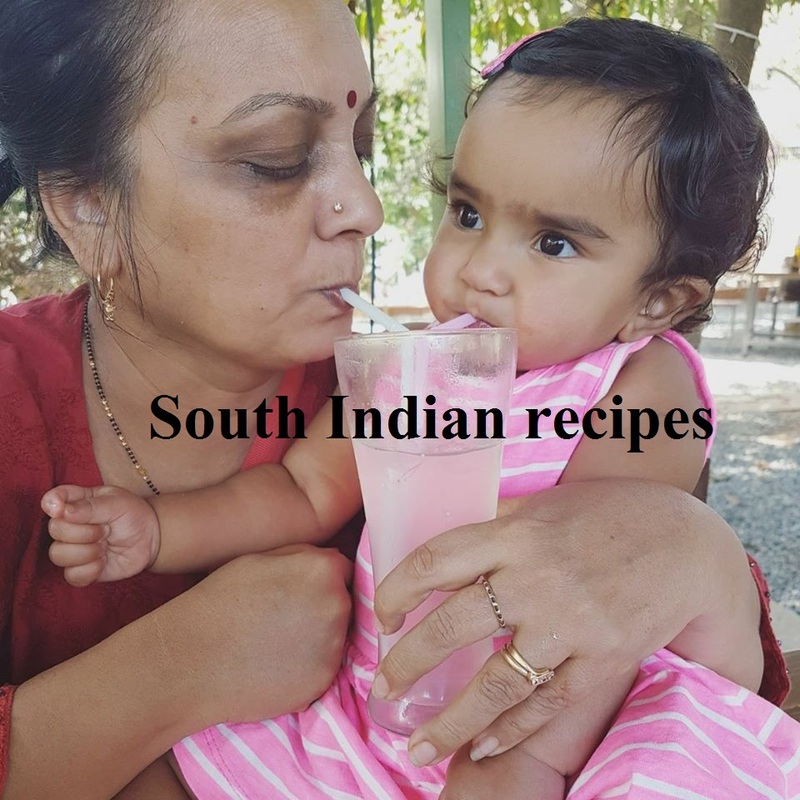 Perhaps you are interested in feeding healthy food to your toddlers. Do you know toddlers need healthy fats for growth and development and to support their cognitive functioning? We will cover fats in another post. Let's talk about healthy nutritious snacks for toddlers and preschoolers. Your tiny tot needs nutritious snacks for at least 3-4 times a day. Yes, this is plain truth. 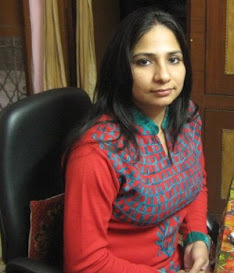 Their small tummies cannot go for the entire meal in one go, which means they need small meals, but healthy snacks in between that can supply their bodies with nutrients while keeping them full and healthy. So what are healthy snacks for preschoolers or toddlers? Well, a healthy snack is one that combines at least 2 food groups - that is, you have got to prepare a snack with any two of these groups, including fiber-rich complex carbs, proteins, unsaturated or healthy fats, low-fat dairy, fruits and vegetables. 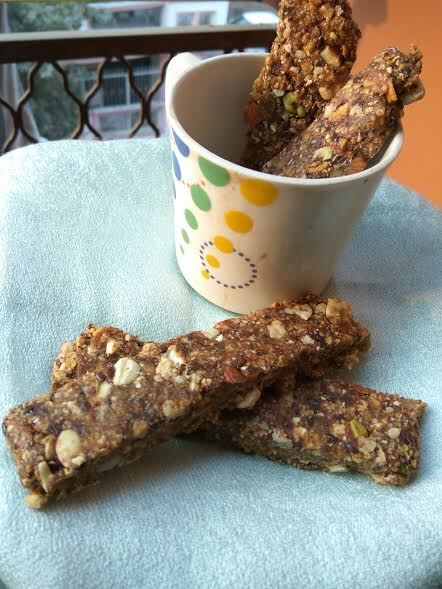 It's a good idea to combine nuts with fruits to make a nutritious energy bar for your tiny tots. This post is all about it. 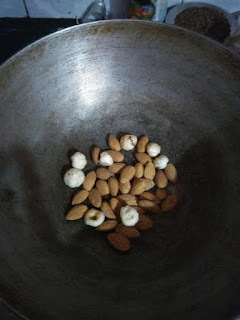 I have written a lot about oatmeal benefits in this blog, and you will find benefits of different nuts as well here. Learn how almond benefits health. Check out how pistachio can be a health boosting nut. You may be surprised to find dates benefits. Do you know dates is packed with fiber? A tsp of honey, a few drops of vinegar, and a handful of dates along with your choice of nuts is all you need to pack a powerful punch with these granola bars. Why buy market junk when these are a breeze to process? 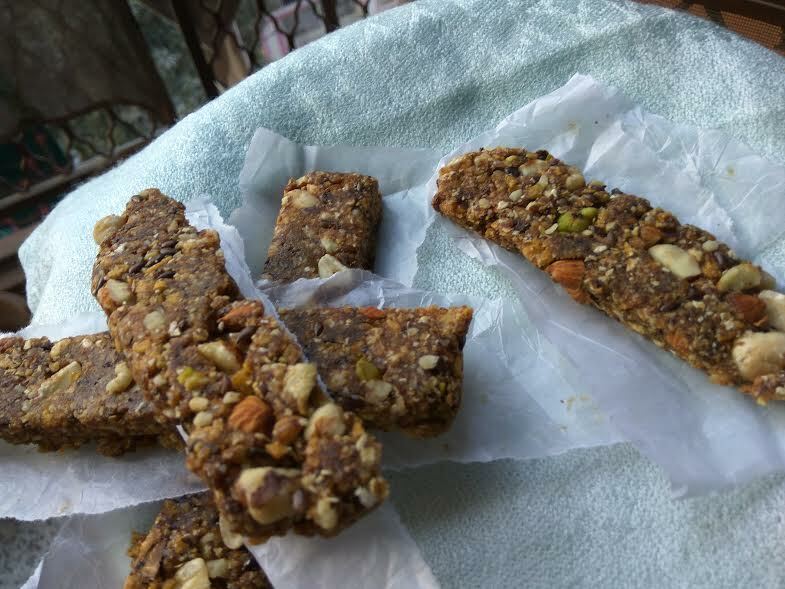 This is a simple energy bar recipe that you would want to try out now. No heating, no cooling, no baking, no freezing, this energy bar recipe is a sure keeper for those looking to please kids and their inner child. If you are craving for a power-packed snack, get your hands on this energy boosting bar. 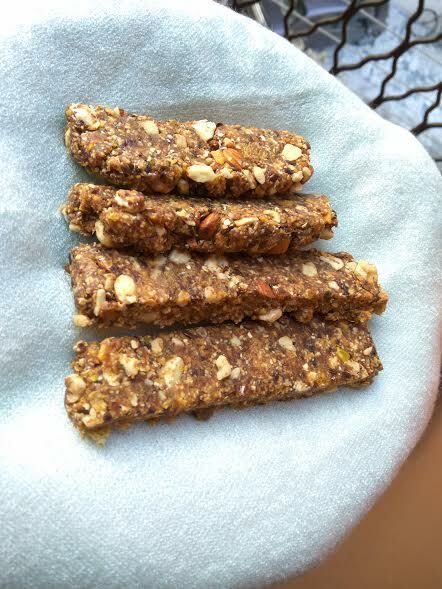 If you wish to please a loved one with a healthy treat, try this healthy breakfast bars recipe. If you want to enjoy pleasure of health with no compromise on taste, this energy bar is all you need! If you are looking for a healthy breakfast bars recipe, this is it! 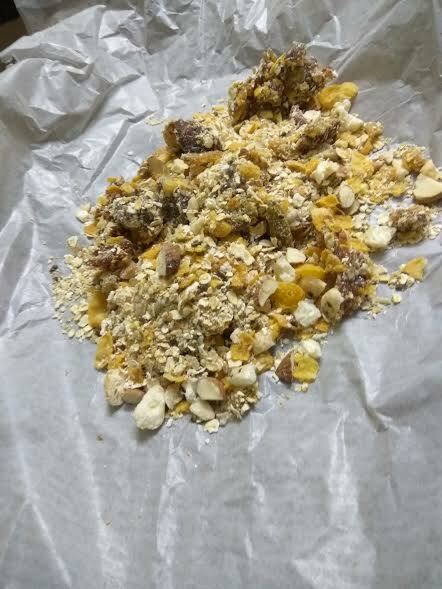 Let's get back to the oatmeal energy bars recipe - the best nutritious snack for toddlers, preschoolers, and adults alike. 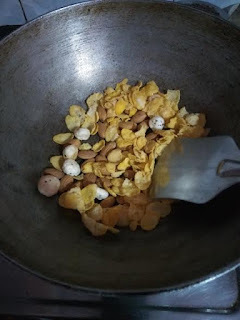 The best part about this recipe is you can play around with ingredients ...add the amount of cornflakes and makhana for that crunchy feel...of course, you are free to add more of nuts. Let's start making the nutty bars! Dry roast cornflakes, almonds, and makhana. 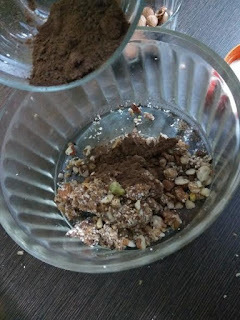 If you are using sesame seeds or flax seeds, dry roast them here. Grind dates and raisins. In my case, my processor wasn't working so I had to do this with hands. It was a tough job, but I didn't quit. Mix everything. Add slivered pistachio as well. 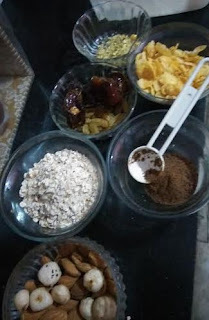 Mix Bournvita or Horlicks or any energy powder that you wish to. You may even add cocoa powder. Now add vinegar as well. 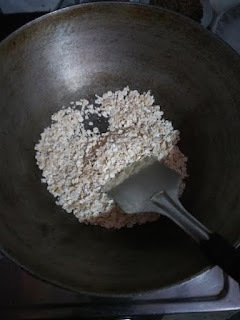 Vinegar will add slight tanginess to the oatmeal energy bars. It's a great preservative as well. You may skip it and add a pinch of salt instead and toss everything together. Do not use the grinder or food processor now. We do not want to powder the ingredients, rather, wish to keep the crunch intact, so try collecting everything with hands and start binding. If binding seems to be a tough job, add honey. It will get easier. You may shift all ingredients to a butter paper or aluminum foil and then use a rolling pin or belan to press everything, so you can flatten them and get the right shape. Keep them pressed with a heavy utensil for half an hour. Your granola bars are ready. Wasn't it a super simple granola energy bar recipe? 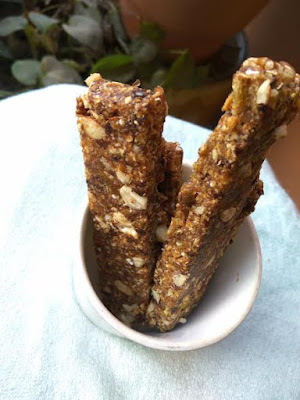 After a little bit of struggle, I was able to make these crunchy energy boosting bars. Don't they look tempting? Try these power-packed bars now and you will be sorted. You won't ever buy market stuff again! This is one healthy, nutritious snack for preschoolers, toddlers that your kids will instantly fall in love with. Take a bite yourself when serving this healthy snack to toddler, and they will not hesitate to follow in your footsteps. PS: If you do not want to use dates, you may try adding jaggery powder instead. Heat it on a slow flame until jaggery melts. Put 2-3 bsp of water in a pan, add jaggery powder and allow it to melt. 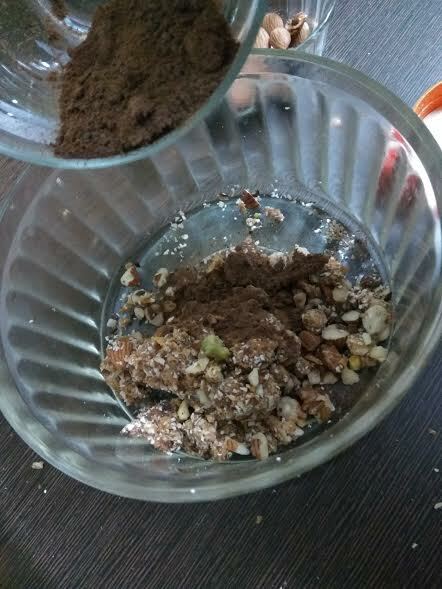 Then add the energy boosting powder or cocoa powder and then throw in all the ingredients, except honey. 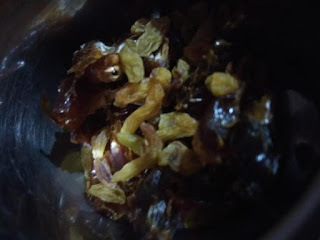 Keep stirring until jaggery coats every ingredient. Turn off the flame and add honey and try binding everything together. You will get energy bars without dates. I have to take out time to try this...so long pending. Try it dear. It's a perfect treat to munch for kids and elders alike. 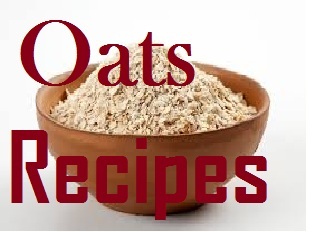 Oats are an integral part of granola bars. But if you still do not wish to include oatmeal, skip them and add more of cornflakes or other multigrain flakes. I would still advise to include oats in your diet. The benefits are manifold! 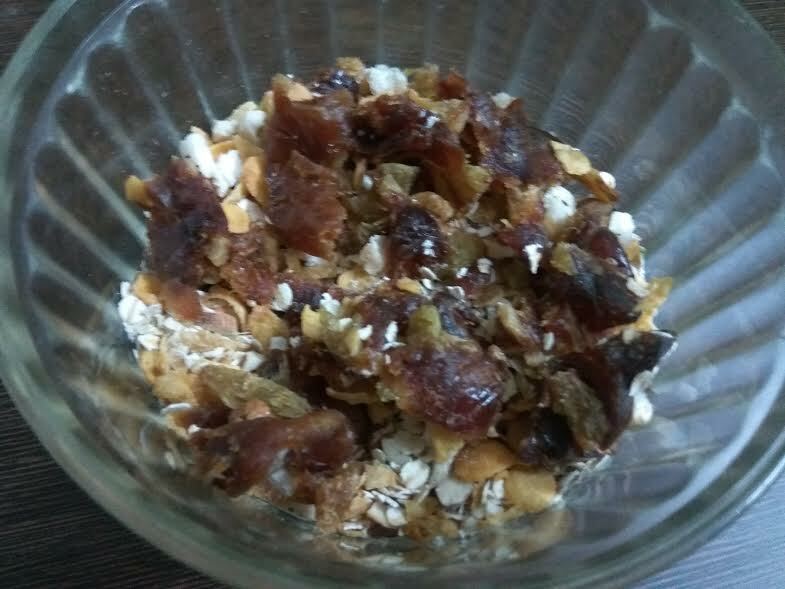 Hello ma'am...i tried this receipe of yours with slight variation... according to ingredients available in my pantry....i cameout so yumm!!! Wow! 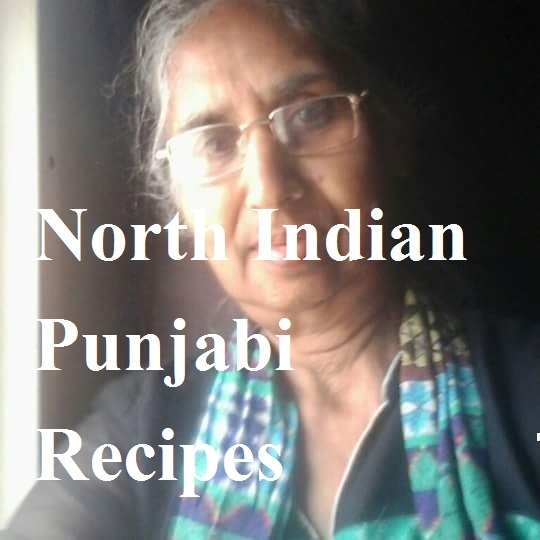 I am so happy you liked the recipe.Do share the food pic for feedback. Thanks once again for stopping by!